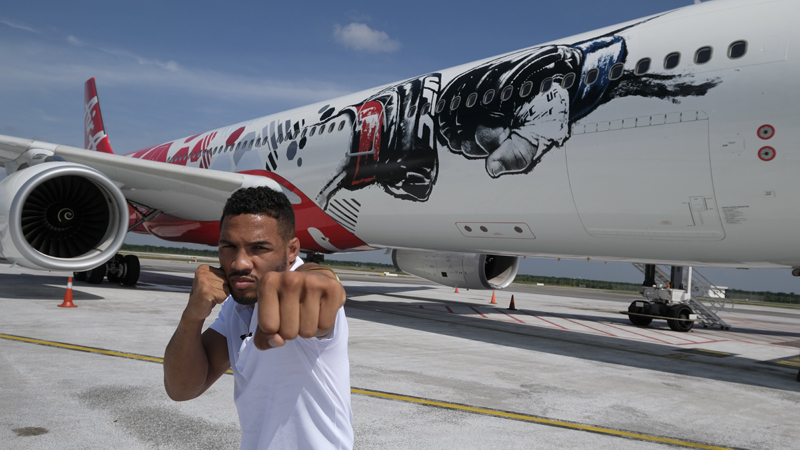 Kuala Lumpur, Malaysia – UFC, the world’s premier mixed martial arts organization, and AirAsia, sponsor of UFC and presenting sponsor of UFC® FIGHT NIGHT SINGAPORE: COWBOY VS EDWARDS presented by AirAsia, today launched the first UFC – branded livery on an AirAsia Airbus A330-300. Tickets to a thrilling night of sporting action at UFC® FIGHT NIGHT SINGAPORE: COWBOY vs. EDWARDS presented by AirAsia are priced at S$378, S$268, S$198, S$148, S$98, S$68 and S$48 (prices do not include booking fee). Tickets are now available for purchase online at www.sportshubtix.sg, the Singapore Indoor Stadium Box Office, Sports Hub Tix Outlets, all SingPost locations, and by calling Sports Hub Tix Hotline at +65 3158 7888. Additionally, fans can opt for limited UFC VIP Experience packages ranging from S$888 for Super VIP to S$2,888 for Owners VVIP, with the very best Octagon-side floor seats. All packages include exclusive VIP hospitality in the VIP Lounge, where fans have access to photo opportunities with UFC guest fighters and the UFC Championship Belt. Select packages include a private ‘Inside the Octagon’ Tour and access to the Official After-Party.